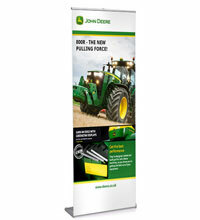 RAL Display has been supplying exhibition stands for over 35 years. We pride ourselves on offering an unbeatable range of products which can be designed and built to suit any budget and stand size. Making the right first impression at your show is essential when you're just one of many exhibitors trying to attract the eye of potential customers. 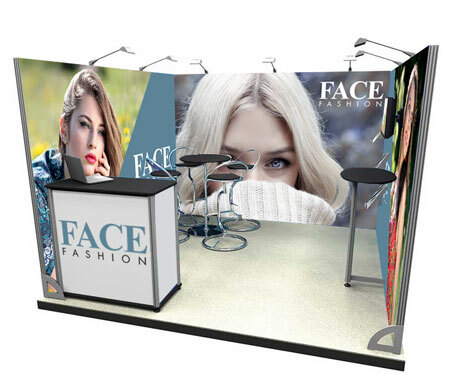 Our stands are designed to be portable and reusable providing an attractive and economical solution to professional exhibiting at trade shows and conferences. The removable graphics can be replaced to suit new products or rebranding requirements. Planning how you would like your area to look and what you would like to go inside the stand can be tricky. It reflects you and your company so getting it right is essential to the exhibitions overall success. That all important wow factor is not easy to achieve without an endless supply of money, this is why our team of experts are here to help guide you through, giving you ideas and inspiration along the way. The image gallery below gives you some examples of popular stand configurations including back-walls, L-shaped, U-shaped and space only areas. Please contact our sales team on 0116 2554640 if would like to talk through any of the options in more detail and remember our bespoke exhibition stands can be adapted to suit. This range focuses on curved popup stands and straight popup stands. 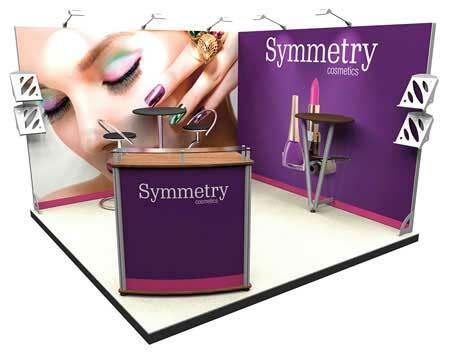 We offer an all-inclusive package which includes full colour graphic panels, a lightweight aluminium framework, easy to locate slim line magnetic bars, 150w floodlights, a wheeled transit case and a case to counter conversion kit that transforms your storage case into an attractive exhibition counter. Our exhibition bundles include all the necessary hardware to make your organisation stand out at trade events. 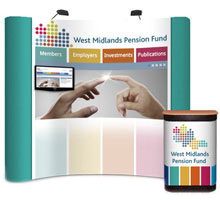 Our varied packages include curved and straight popup stands, pull-up banners and in some cases portable brochure stands. 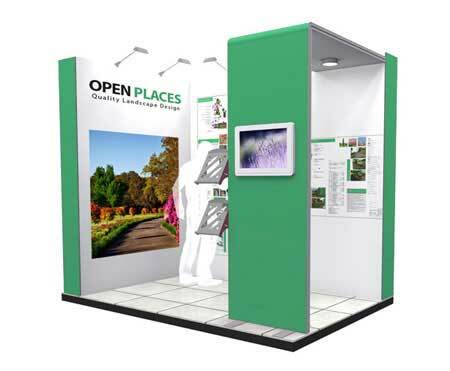 If you would like to create your own exhibition package please call us for more information. 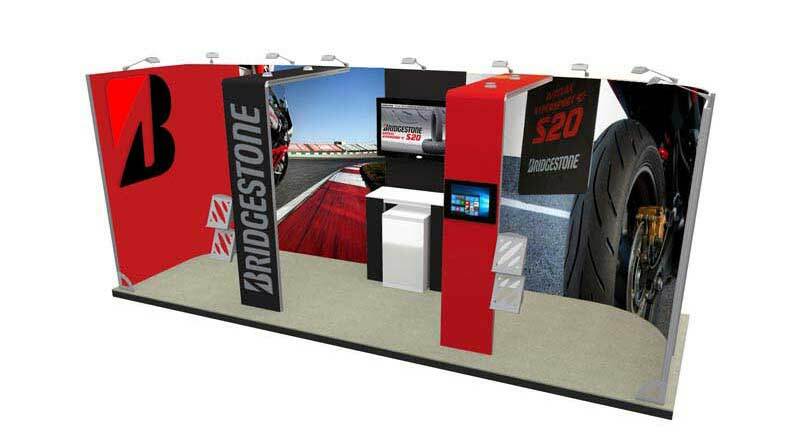 This is a great alternative for companies wanting to integrate TV screens into their exhibition stand. There are two options available depending on your requirements, a smaller TV monitor which displays screens up to 22” (5kg) and a larger TV stand which holds screens from 32” to 50”. Our trained sales team are also more than happy to help you pick out a TV so you can be 100% sure everything is compatible, ready for the big event. 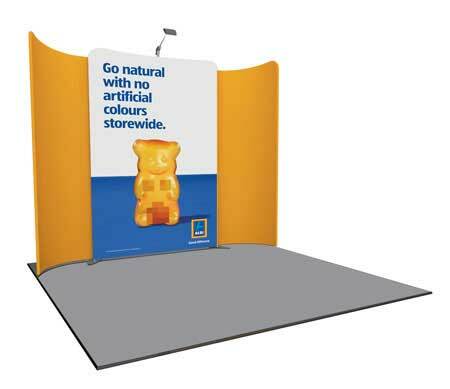 Our L-shape popup displays sit beautifully within the corner of an exhibition booth and pack neatly away into the supplied wheeled cases for trouble free portability. Once assembled it gives the impression of a custom build stand, offering a seamless graphic back drop covering the back and side walls. You can also rebrand the framework with new graphics allowing you to use the system at numerous events. 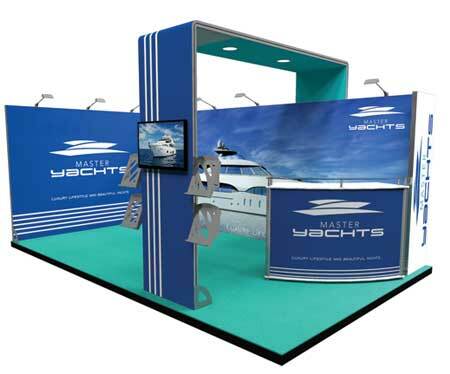 Prices start from under £1000 + VAT which is considerably cheaper than bespoke MDF trade show exhibition stands. These are defiantly worth considering if you want something that covers more than just the back wall of your shell scheme. 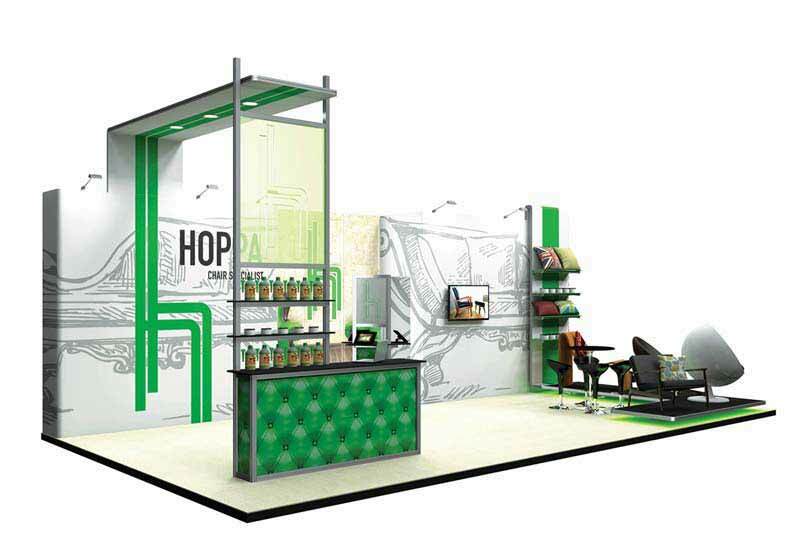 The Hop-up is a unique stand that work in a similar manner to the traditional popup displays but incorporates a polyweave fabric graphic. The graphic is attached to the structure with heavy duty Velcro, so it can be assembled in a matter of seconds. 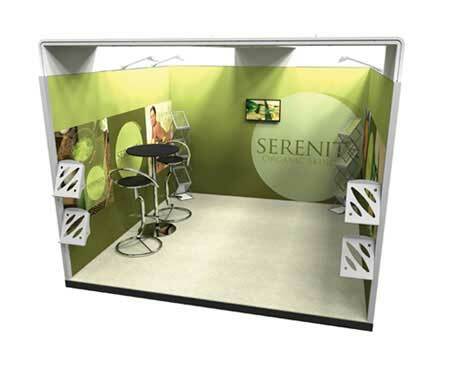 It is also recognised as being the most lightweight exhibition stand on the market and is available in three sizes. Each system also includes a wheeled bag for easy transportation. 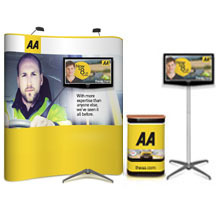 Our exhibition counters are ideal for trade show events and are supplied with either a branded graphic or fabric wrap around. Use to display products, literature or to take down customer enquiries. Also see our range of round and square exhibition plinths which can be produced in different heights and worktop sizes providing attractive product displays. They take very little time to assemble and can be easily transported by car. All of our exhibition graphics are printed in-house so we have total control over deadlines and distribution. Our premium graphic panels are produced using original HP inks and are coated in a scratch resistant laminate. We also offer a design service working of £35.00 per hour so if you need a little inspiration why not speak to one of our designers today. Planning for trade show events and exhibitions is essential, so to help you set out a clear strategy and action plan we have written a helpful guide called How To Prepare For An Exhibition. This article focuses on key areas such as research, budgeting, staff training and stand appearance. Our knowledge and expertise allow us to offer the best possible advice so if you would like to discuss your individual requirements please call our friendly sales team today on 0116 2554640. We look forward to hearing from you. What area is available and where is it located within the exhibition hall. You may have a preference to be close to the entrance or near to a central stage where guest speakers are appearing. Maybe this will result in more passing trade. Also, how many open sides do you have? This will determine what sort of shape or style of stand you go for. If you have 2 open sides we often recommend an L-shaped design. Have a think about what sort of look you are trying to achieve. 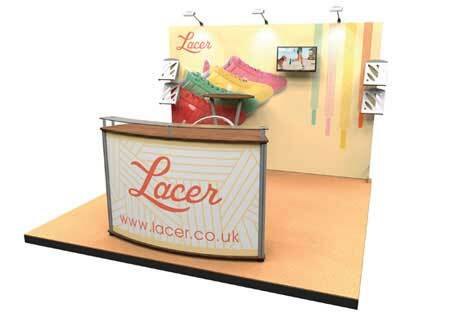 Consider how your company’s branding and general ethos can be worked in to the stand’s design. Important elements such as the company’s logo may be better advertised on a hanging structure above the area, making it visible around the venue and freeing up floorspace. Think about if you would like to include certain features such as display plinths for showcasing products or welcome counters for greeting guests. Another popular request is the integration of TV screens. Running visual presentations is great at catching people’s attention without them necessarily having to enter onto the stand. Some people prefer to look from afar, so this is another way of connecting with people and informing them of your products and services. If we have a clearer idea of your budget, we can offer you the best possible options from the start. 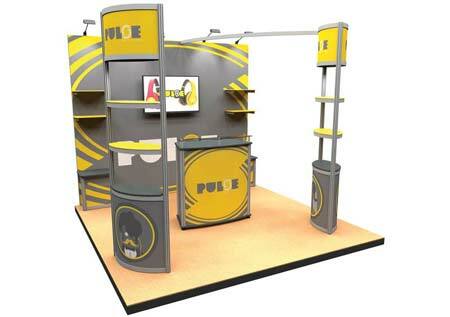 There are endless possibilities when it comes to kitting out a trade show display, so it is preferable if we can focus on a design that matches your requirements and price range from the begin. After talking through your brief we can supply you with a 3D stand design so you can realistically visualise what your display will look like before the event. We can also assist in the actual design of the graphics or just offer advice and technical information to your in-house creative team. RAL Display offers a unique service whereby you can see your exhibition stand being tested and built in a pre-build stand area. Not only does this give our guys the chance to address any potential issues it provides you with reassurance that everything will be ok on the big day. Speak to us today about this fantastic service! Wide range of accessories including TV mounts, leaflet holders, overhead hanging structures, branded archways, counters and lighting. 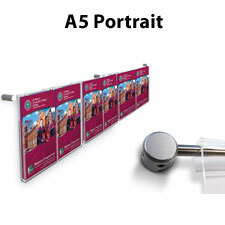 RAL Display also offer an exhibition stand hire service. We provide a range of panel and pole double sided display boards which can be clipped together to create back walls for your stand space. Please call us now to discuss your requirements.